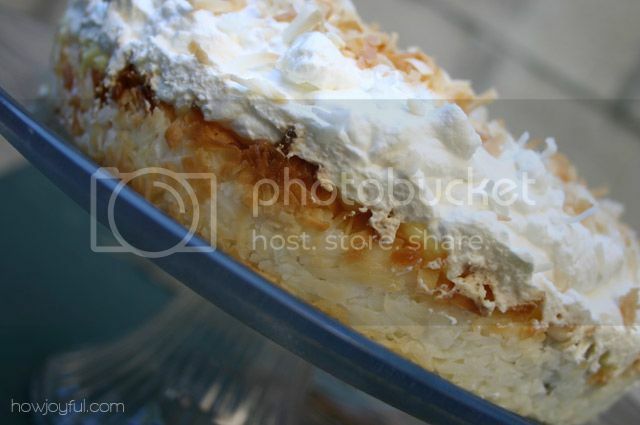 A few weeks a go I read an awesome Double coconut cream pie recipe in my mother in laws magazine All you. Just with the picture I was sold on trying it, but the filling was not as good as I expected, so I decided to change it and make my own, well kinda. So today I want to share my version of the recipe, because it's not only pretty it's DELICIOUS! I bake it for our first legal marriage anniversary last week and Ken and I loved it! It is very sweet so if you get tired of it easily, just serve really small portions. Trust me it's worth it! Preheat oven to 350F. Mist a 9-inch pie plate with cooking spray. Place 3 cups of coconut in a bowl. In a pan melt the butter. Stir butter into coconut until moistened. Press mixture into bottom and sides of pie plate. Bake until crust is light golden brown, if edges are browning before bottom, cover edges with strips of foil, 20 to 30 min. Check often. Take crust out of the oven once done, sprinkle chocolate chips over hot crust and let stand until melted. refrigerate for 1o to 15 minutes. Mist a cookie sheet with cooking spray. 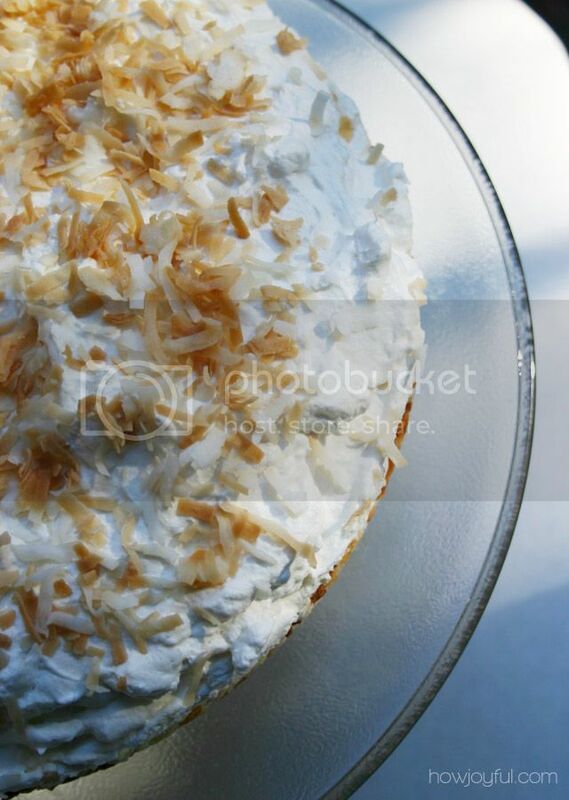 spread coconut and cook for about 10 minutes or until golden brown, check often. Prepare Jell-o instant vanilla pudding according to direction with the 2 cups of COLD milk, once its start to soft-set add the other 2 cups of sweetened flaked coconut and mix. Poor custard into crust cover with plastic wrap, pressing directly against surface of custard and chill for 15 minutes. Using a mixer, beat cream until stiff peaks form, add the vanilla and sugar slowly and keep beating. Spread whipped cream over custard swirling decoratively. 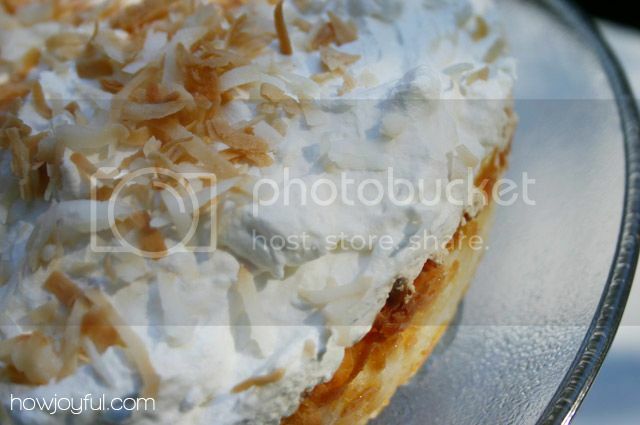 Sprinkle with toasted coconut, Chill pie for 30 minutes and its READY! 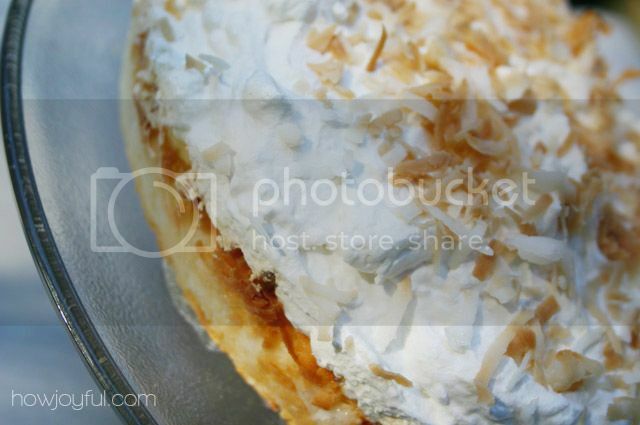 I really recommend to try this, well if you do like coconut. My Mom can't stand it so of course I will not make it for her hehe! Oh, YUM! That looks and sounds sooooo good. Wow!